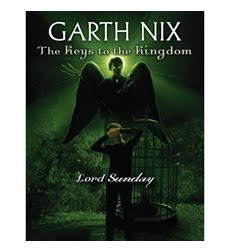 Lord Sunday by Garth Nix. Scholastic. 2010. Review copy from publisher. On the first day, there was a mystery. On the second day, there was darkness. On the third day, there were pirates. On the fourth day, there was war. On the fifth day, there was fear. The Plot: Arthur is falling; Suzy Blue is imprisoned; Leaf is surrounded by radioactive fallout. Somehow, Arthur must get the final part of the Will and the seventh key from Lord Sunday. Is it enough to triumph over Lord Sunday? What will happen when all the parts of the Will are rejoined and become one? The Good: The seven parts of Keys to the Kingdom is a stunning sequence of books; more like seven volumes of one book than seven books. At first, it didn't seem like that. It was Monday; there was an adventure. It was Tuesday; there was an adventure. But then, wow, realizing that more, much more, is going on than a simple quest by Arthur to find the seven keys and seven parts of the Will. The layers of Nix's worlds astound. Obviously, Lord Sunday is best read if you've read the other books in the series. Otherwise - well, it can be confusing. Plus, part of the pleasure of this series is how it begins so simply. Arthur accidentally pulled into a world and adventure he knows nothing about. a fairly common occurrence in children's fantasy. What isn't common? How elaborate and detailed Nix's fantasy world is. It is dense in the best sense of the word, because there is so much more to this world. There is the House (the Lower House, the Middle House, the Upper House); the Far Reaches; the Border Sea; the Incomparable Gardens. It has its own entry in Wikipedia, trying to sort it all out, and NO, don't go there until you've read the books. It's best discovered by Nix's books. This isn't a book "based on" or "inspired by" existing mythology or religion; it is its own creation. Creation... Like many things that are created there are references to things that are familiar to us, almost half-remembered bits and pieces put together and reinvented. A Piper, a Mariner, the Old One, the Architect. You think you know them, but you don't. So, yes, there are references but they are used in such new and different ways. So there is a garden; and an apple; and a snake; and a woman who bites the apple. But it is not Eden. Arthur's Earth. His Earth is clearly not our planet, even though for the first few books I thought it was our Earth. If it is, it's a few years into the future. Or maybe it is just one of the many worlds in Arthur's universe. Worlds created by the Old One and Architect, creating something out of Nothing, creating people. Powers, immortality -- and while Nix stays away from using words like "God"
or "Angel," c'mon. An all powerful entity creates the world out of nothing. Almost immortal beings with wings are at times loyal to the creator or disagreeing with his vision. Humans are the only creatures who can truly create. The creation origins of this story, this world, this Earth are radically different from those of our world, yet at times so familiar, like a half-remembered sentence or a sense of deja vu. And the ending... Lord Sunday delivers everything the last book in a series should. And then some. Some things that the reader had begun to suspect, or fear, come to pass. Middle school book? Oh, yes, middle school students will read and enjoy this series, but the questions and answers given are food for thought for older teens and adults. Arthur may be a seventh grader in the first volume of the book, as is Leaf, but the inhabitants of the House (Suzy, the Will, the Denizens) are all hundreds if not thousands of years old. Or older. And Arthur himself ages, in time and temperament and even appearance, as these books go by. The seven days? Hardly twenty four hour days. If you haven't read The Keys to the Kingdom, what a wonderful time to start! Having to wait between books was especially frustrating because of the cast of characters and the slow unfolding of the complex world. Too much time between books meant spending time trying to remember how it worked, and re-aquainting myself with the various characters. But to read this all in one sitting (or, OK, one week... one sitting is a bit much), wow! What a treat. I envy you. I loved these books! So original, with so much going on throughout the whole series--so many little subplots and intricacies. And the end really lived up to the rest of the series. Love. I need to go back and reread them all as a whole, because I forgot so much between Monday and Sunday. :( I do not love these as much as the Abhorsen books, but I do like them an awful lot. I love these books and I love tea! !